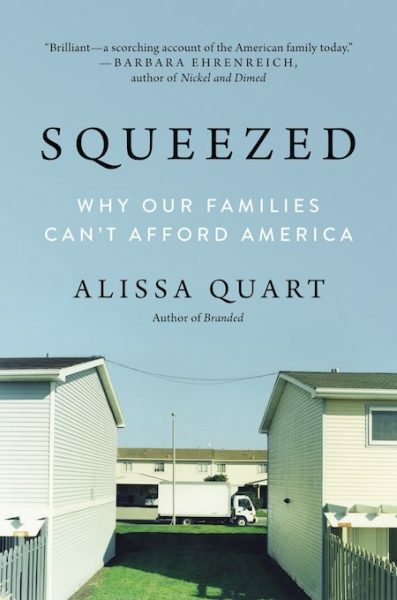 The trouble with having written daily Billfold posts for the past four years is that it’s hard to read a book like Alissa Quart’s Squeezed: Why Our Families Can’t Afford America and not find it all too familiar. We’ve discussed Quart’s work on The Billfold before; you might remember her Pacific Standard piece about 24-hour daycares, a recent childcare development that gets its own chapter in Squeezed. The book’s subtitle, “Why Our Families Can’t Afford America,” is also its thesis; most of Squeezed focuses on the experience of parents with small children, whether they’re single mothers who need 24-hour daycare thanks to their employers’ “flexible schedules” or Uber dads driving up extra cash after a full day of work. The Uber dads, of course, are able to pick up their second shift because the uber-moms are taking care of the one at home — and if that sounds a little heterocentric, it’s because we still live in a culture where women are often the default care providers. Quart’s first chapter looks at the costs of pregnancy, from medical bills to career tracks; her final chapter argues that we won’t stop feeling squeezed until we “reframe care,” both in terms of parenting (which is more expensive and labor-intensive than ever) and care professions (which are equally labor-intensive and shamefully underpaid). And yes, you might be thinking “well, I know that already.” But you shouldn’t skip Squeezed just because you’re aware that America is the only industrialized nation that doesn’t require employers to offer maternity leave. Squeezed is a book of stories: the adjunct professor whose son has quadriplegic cerebral palsy, the married couple who put out a Craigslist ad for a coparent, the Paraguayan nanny who finally has enough money to bring her son to America. You’ll learn all of the ways these individuals have tried and/or failed to establish financial security in an economy that squeezes them for both money and time. The first internal shift is this: stop placing blame. Parents either blame themselves or blame others for their problems. We need to change both of these reactions. Big yes on Squeezed! I’ve been reading it also and it’s like all of the doing money interviews featured but I really loved how the author got the point across that just because you feel like you are struggling doesn’t mean you are doing anything wrong. Which, again, is something that a lot of us know — even if it takes a book to help us realize it.